Today the round 2 results came in and I made it to round 3! I'm so excited and can't tell you how thankful I am for everyone that voted! There were some amazing projects out there and I was a bit nervous! These ladies have some serious talent and I'm very grateful to be apart of the contest with them. If you haven't got a chance to check out all the round two projects please visit this link here. And if you want to see how everyone did with the results of round two please check this link here! So now that the voting has closed I get to share my entry that was submitted. 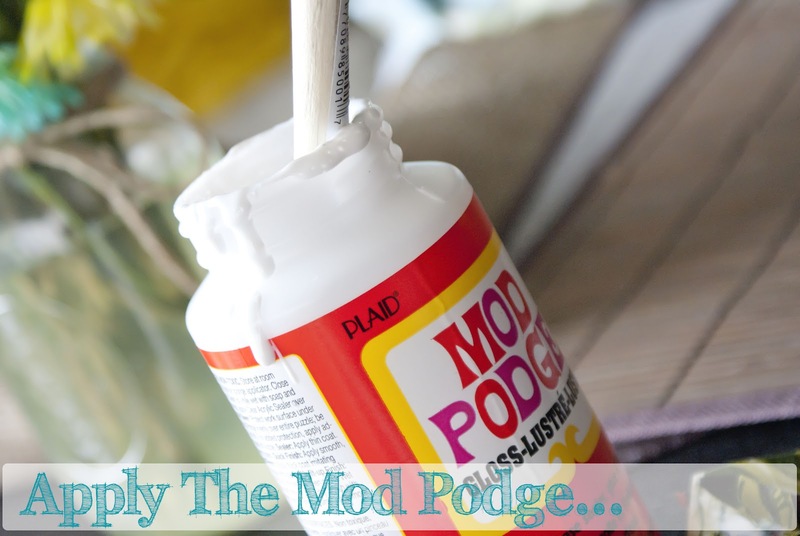 This week was a hard one for me because I never have used mod podge other than for gluing purposes or as a sealer for burlap. 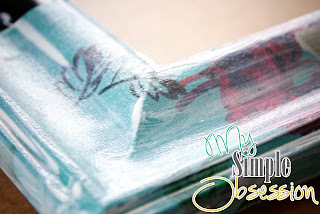 I really wanted to recreate a Anthropologie mirror,but it was a bit harder then I had originally thought and I had messed up the mirror part too late in the competition to get another mirror and redo it. So I turned my mirror project into a chalkboard project! That was the bad news... The good news is, I can do a tutorial on the mirror later on and you all get another great tutorial to look forward to! ;) Now on to how I created this beauty! 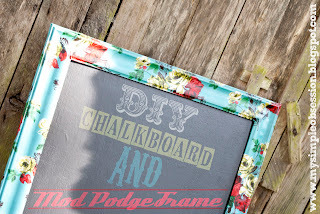 Take your mod podge and apply it to the frame along the side you are going to lay your fabric. Make sure you get in all the cracks and groves. 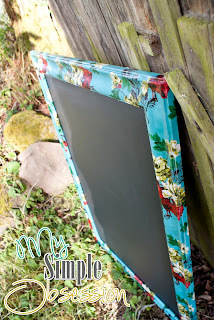 Then lay your fabric over the glue and press it down so it molds to the frame. *Helpful Tip* I cut in the corners where I would be wrapping my fabric in a later step to make it easy to mold my fabric to the groves of the frame. You will then take the mod podge and apply a heavy amount over the top of the fabric. 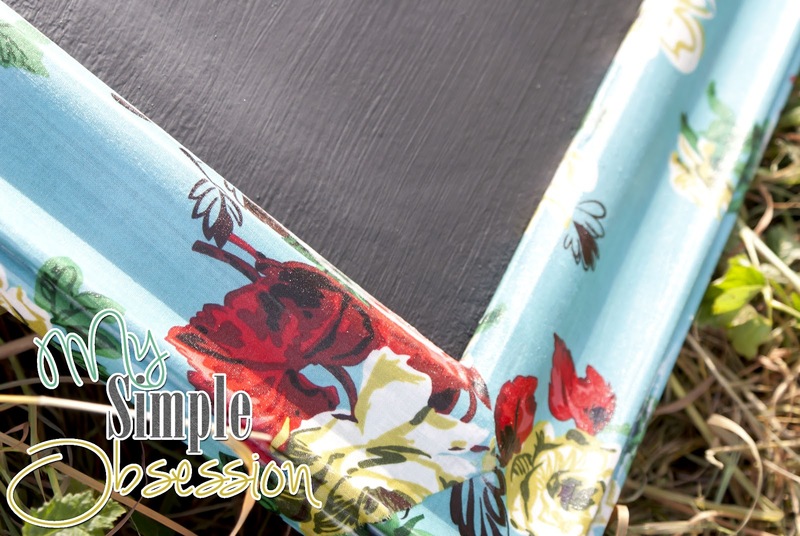 *This can get messy* I like to use a wooden skewer to make sure my fabric molds well. Refer to the picture below on step two. You will repeat steps 1 & 2 on all sides before moving on to step 3. After all four sides dry, flip your frame over and apply mod podge on the frame to wrap your fabric. Press down and then apply more mod podge on top of your fabric like you did on the other side of the frame. Make sure your front is dry before you wrap or you might pull too tight and create bubbles and the frame will lose its form. Also don't worry if the back doesn't look perfect... "No one can see that part!" REPEAT step three for all back side wrapping. 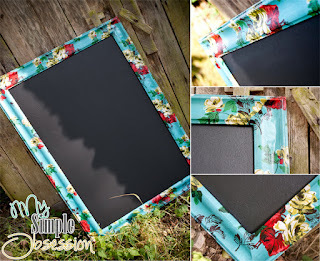 Take your cardboard frame backing that you would use to keep a picture in place and paint the front with chalkboard paint. If you use the paint that I used below you will need to sand it after it dries. If you prefer to use spray chalkboard paint, you may not have to sand it, but you will need to take your chalk after the paint is dry and completely cover it in chalk and then wipe it off before use. I like the paint in the can because I like my chalkboards to be thick so it doesn't chip. I sand to get a smooth finish and I also get to skip the chalk covering because the sanding sets my board up for me. And there you have it! 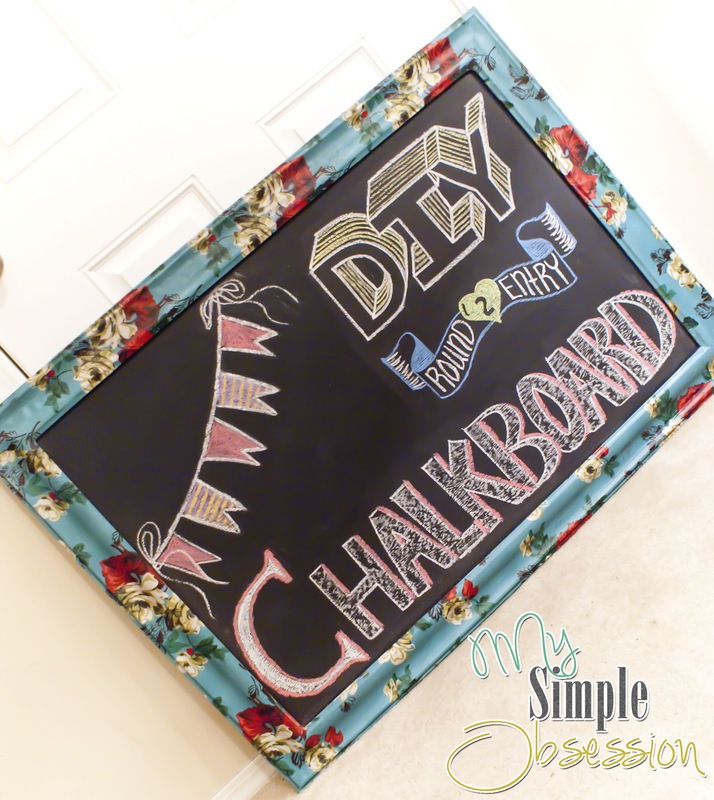 A beautiful chalkboard that can be customized for any room or office you want! I currently have mine in my office because it matches the color scheme I'm Leaning on for a office makeover! More on that in the future! I really hope you all enjoyed this little tutorial on how I made my round two entry! It may have been stressful because it wasn't what I wanted to do in the first place, but the end result turned out better then I had expected! 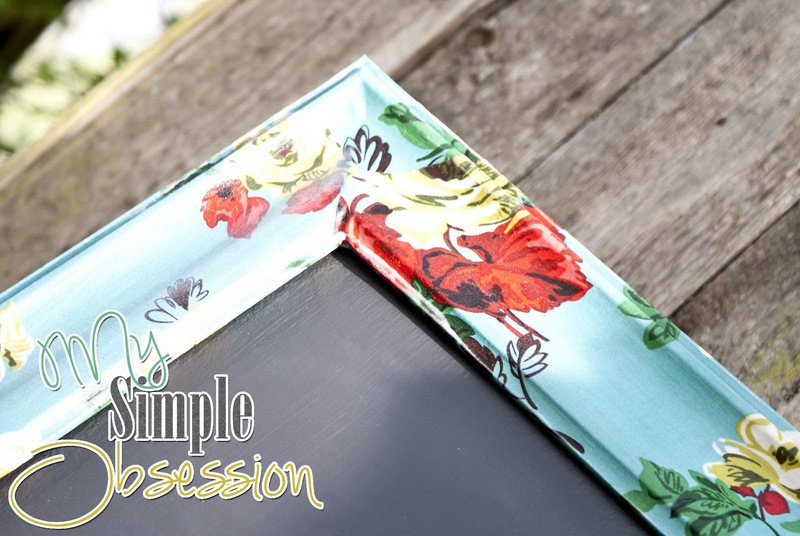 Please let me see all your fabulous creations you create using this tutorial! I love everything you make. Been voting for you. You didn't mention the corners. Are they mitered and if not how did you treat them? In step two it tells you that I cut the corners before I applied the mod podge. I let the front dry then flipped the frame. Applied the glue to the sides and back and folded it over. I folded the corners like wrapping a present if that makes sense. Then applied glue on top. You didn't mention the corners of the frame. Are they mitered? If so, how did you do this. If not what did you do instead of mitering? 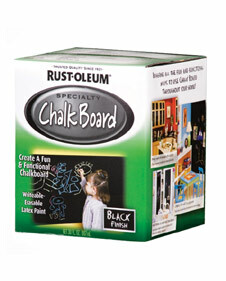 What if you wanted a permanent design but still wanted to keep the authentic chalk look. Is that possible?